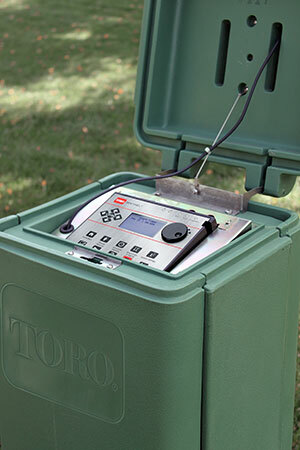 The Toro Co. released its new Sentinel Central Control system. The new system allows users to schedule and manage daily operations from a PC or iPhone and iPad using NSN Connect. Program data is stored both at the field controller and within the central computer, so if a computer or master controller goes offline, there is no loss of irrigation. Field changes to controller programs can be uploaded to the computer. Controllers are available with conventional 24VAC wiring, both AC and DC two-wire, and come in a variety of enclosure options. Sentinel’s wireless output board technology offers additional surge protection for the control module as well as the ability to expand the station count on a controller up to 204 stations, with a radio range of up to 3,000 feet line of sight from the controller. Additionally, Sentinel now can track up to 16 flow inputs per controller individually. Monitoring alarms report any system component failure, including communications, over- or under-flow conditions or power failure. Pipeline breaks, malfunctioning valves and missing heads are automatically detected and shut down to prevent water loss. Additional upgrades, such as the Toro Pro Series Soil Sensor, Turf Guard soil sensor, web-based Precision-ET or an onsite weather station, are also available with the Sentinel system. Toro backs all Sentinel central control products with a minimum of two years of National Support Network service, including unlimited 24-hour toll-free support and year-round emergency paging. Technical and software-specific support is also provided.